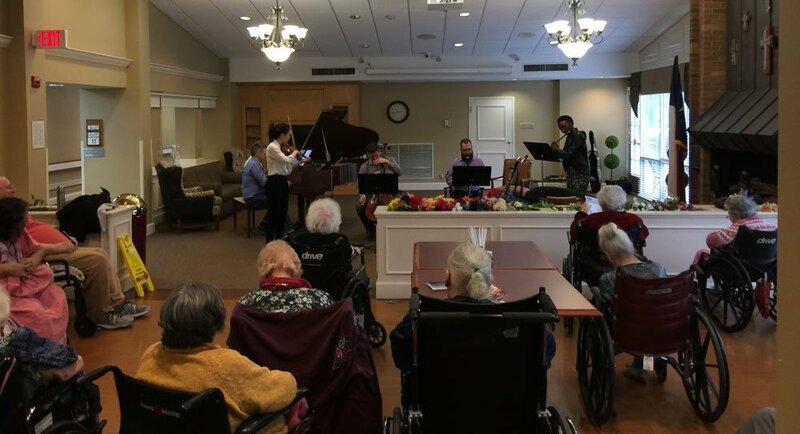 On March 11 Eighth Blackbird shared their talent with a segment of the population that is too often forgotten. 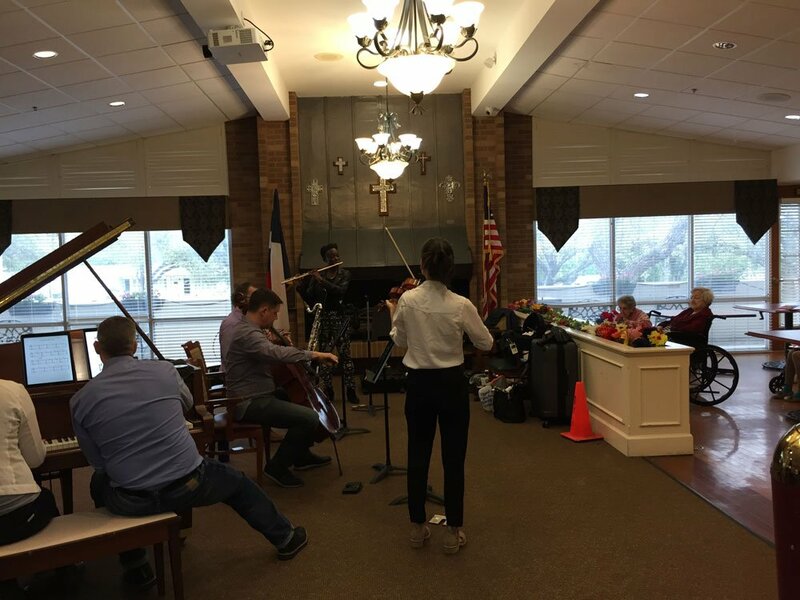 They played for an hour in the Morningside Manor assisted living unit. Their pieces were thoughtfully chosen and warmly introduced to the quiet audience of elderly people who mostly arrived by wheelchair. The program was completely different from the music performed by the group on Sunday here in the Temple. We had the chance to hear a compelling work by Eighth Blackbird flutist Nathalie Joachim, from her piece “Fanm d’Aviti” (Women of Haiti). Etude No. 12, a minimalist piece by the revered American composer Philip Glass, was soothingly played by pianist, Lisa Kaplan. Violinist Yvonne Lam gave a riveting performance of a solo work for violin – “Dissolve, O My Heart” by Missy Mazzoli. The group ended with “The Days Run Away” by Peter Garland, a piece for all the instruments that brought the program to a calming end. 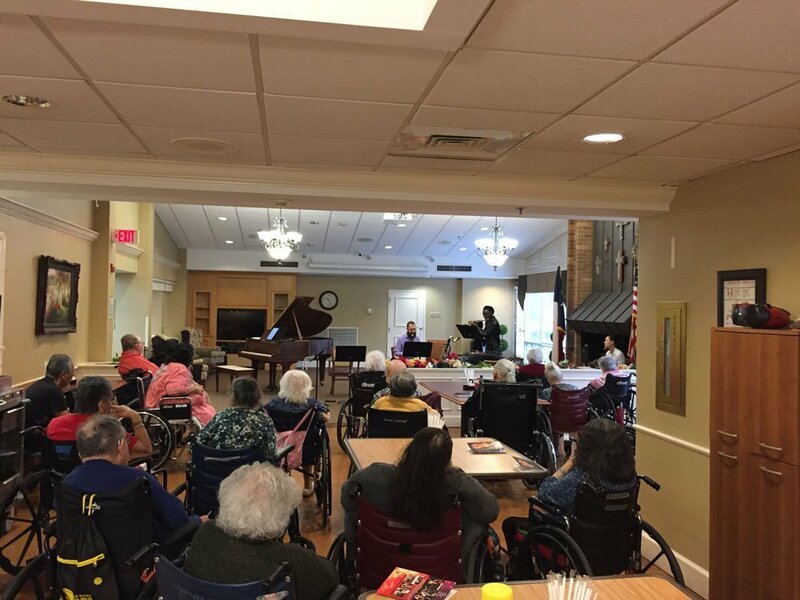 It is difficult to witness a program in an assisted living environment without feeling very much humbled by the power of music to heal and soothe. We are grateful to Eighth Blackbird for their loving kindness in presenting this concert. On Veteran’s Day, Monday, November 12, SACMS hosted one of its most exciting Outreach events ever. 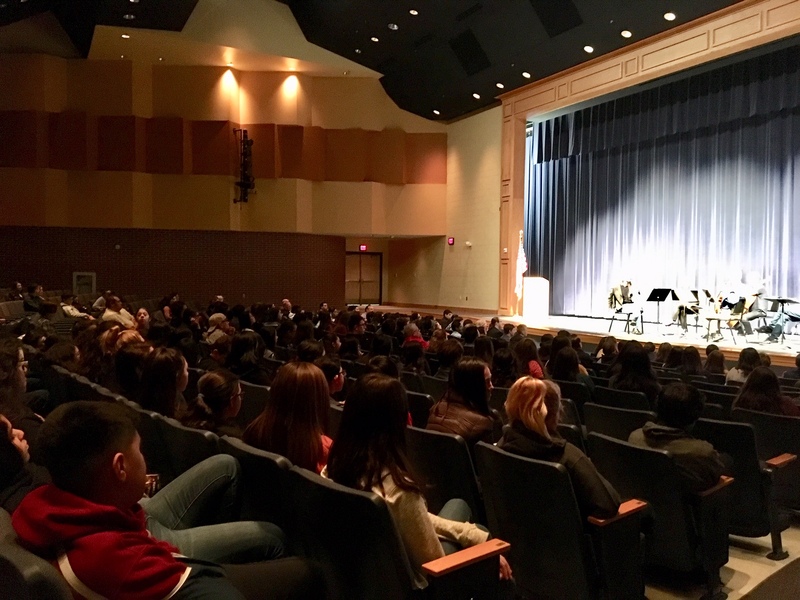 It was exciting because we had 450 music students in the audience at Brandeis High School! The American String Quartet along with poet, Tom Sleigh, pulled back the curtain and explained how they put together their marvelous program Lyric in Time of War. For those of you who were lucky enough to be in the audience on Sunday, November 11, you know this was an unusual program in that it was without intermission or applause until the end. And in between musical selections, there were readings by Mr. Sleigh and author Phil Klay. 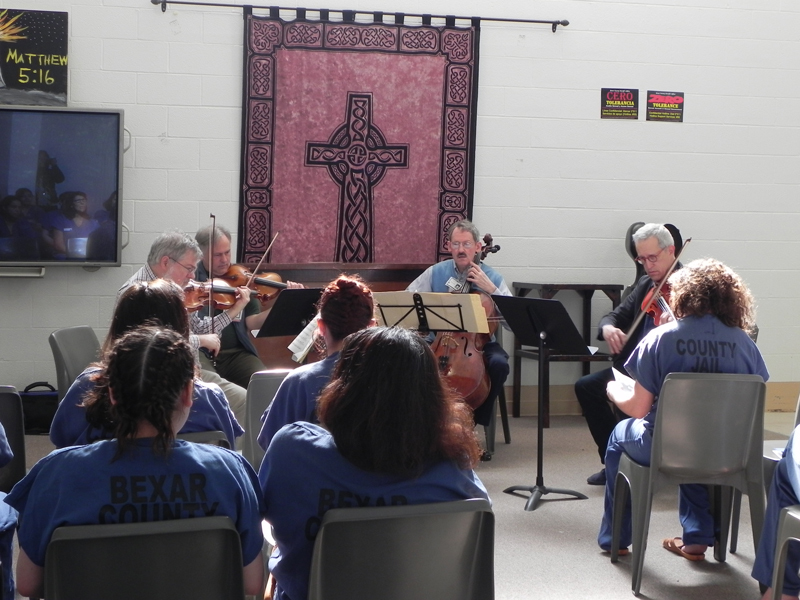 The format was different at the Outreach as artists explained throughout the program how music sometimes says more than words, and the brevity of poetry can encapsulate the essence of a difficult topic such as war. Mr. Sleigh read some poetry during the educational concert on Monday and explained how he chose the poems. The mutual respect and synchronicity of spirit between the musicians and the narrator was palpable to all. The quartet played portions of Shostakovich Quartet No. 8, Bach from Well-Tempered Clavier, Bartók Quartet No. 6, and Beethoven Op. 95 Serioso, all music they chose to express some aspect of war. Or in the instance of the Bach work, peace. The students showed maturity in their numerous insightful and thoughtful questions; they were also rapt with attention when listening. 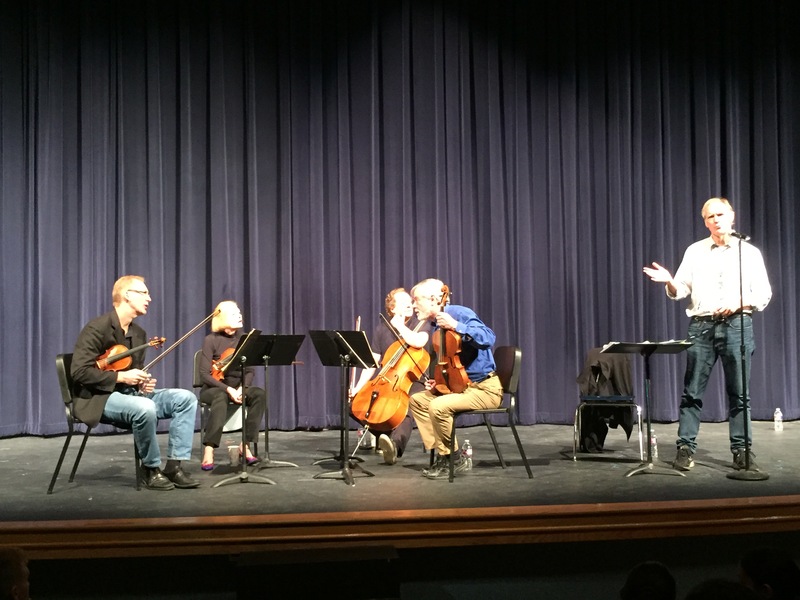 Much of the credit for this extraordinary educational experience goes to Kevin and Jennifer Garcia-Hettinger who are music teachers at Brandeis High School and private string teachers. Kevin went out of his way to bus in several middle school classes of music students. We are grateful to have such generous mentoring in our community for the next generation of musicians. If you enjoy knowing about our Outreach events and want to support more, please consider making a gift to the Mandel Outreach Perpetual Trust. Details at www.SACMS.org. 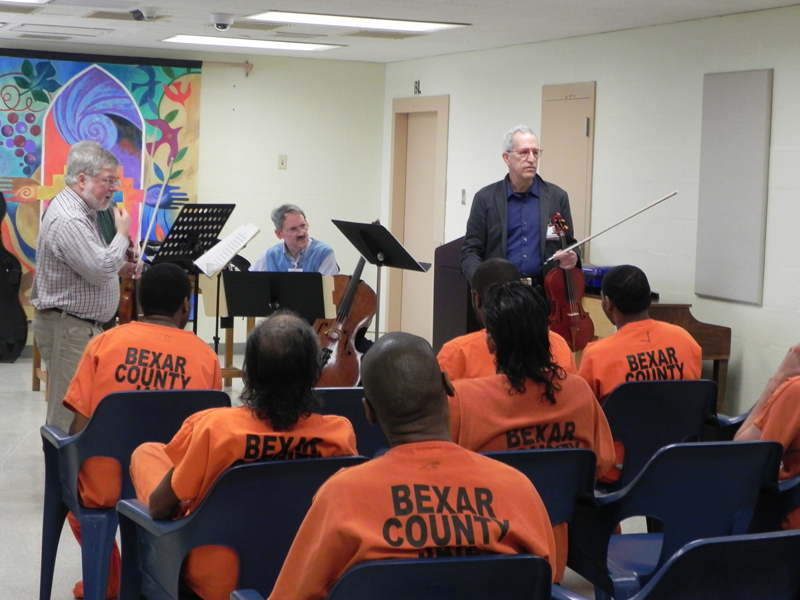 On a beautiful San Antonio spring morning with crisp temperatures, Kenneth Bloom and I set out with the Orion String Quartet on a trip to the Bexar County Jail. The jail has a population capacity of 6,000 and the inmates are awaiting trial. The wait can be up to 2 years. Orion’s music touched the souls of only the tip of the iceberg, but in such circumstances even one touched soul means everything. We started out in the Chapel in the Annex where women are housed. The setting was stark with only blue plastic chairs for people to sit, a rustic altar, and a few colorful posters with biblical verses. There was a bank of windows about 30 feet above the floor that let in peaceful natural light. Violist, Steve Tenenbom, set a casual atmosphere chatting easily with the women who were all dressed uniformly in navy blue jumpsuits. At one point Steve asked if any of them played instruments. About 15 raised their hands and Steve went patiently around the room allowing every woman to say what they played. The quartet played several movements from the program that they played on Sunday for the SACMS. The notable moment in each chapel was when they played the Cavatina movement from Beethoven’s Op. 130. One could have heard a pin drop during this hauntingly gorgeous and introspective music. After 45 minutes, the quartet packed up and we headed over to the main building where they played in the men’s Chapel. The dynamic was quite different. The men, dressed in orange jumpsuits, were much more extroverted in their reactions calling out their (quite perceptive) observations about the music. Again, the Cavatina noticeably calmed the audience. It was a privilege to share this experience with the Orion Quartet who were true diplomats sharing their art and generosity of spirit and good will. 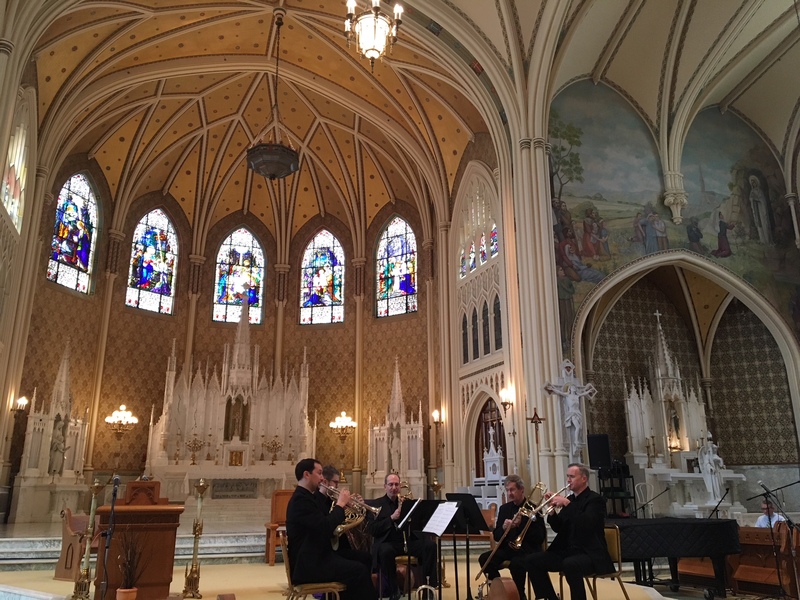 On March 5, 2018 we heard an inspired Outreach Concert by the American Brass Quintet in the stunning Sacred Heart Chapel. The title ‘chapel’ is a misnomer as the building is a remarkably beautiful and rather large English Gothic church which took 28 years to build. It boasts an incredible, at least 4 to 5 seconds, reverberation of sound. The chapel is a great source of pride to the people in the San Antonio community at large and to the West Side neighborhood in particular. It was a fitting spot in which to hear resplendent and impeccably performed brass music. The members of ABQ relished being able to perform in this space. The American Brass Quintet played selections taken from their program performed on Sunday, including the commissioned work the river remembers by San Antonio composer James Scott Balentine. San Antonio Poet Laureate Carmen Tafolla gave a beautifully dramatic reading of her poem, This River Here, which provided the inspiration for Dr. Balentine’s work. There was an interesting panel discussion among composer, poet, and performers regarding the creative process in presenting, experiencing, and creating a work of art. Over the weekend the work was played three times. Each time the depth, flow and mystery of the San Antonio River was expanded. This concert was a fitting and memorable tribute to our San Antonio’s Tricentennial. On January 22 we were lucky to have Fred Scott lead a masterclass for three school choirs. The class lasted an hour and a half with each choir receiving 30 minutes of coaching by Mr. Scott. The participating choirs performed in order of age beginning with Children’s Choir of San Antonio comprised of 5th-7th graders. 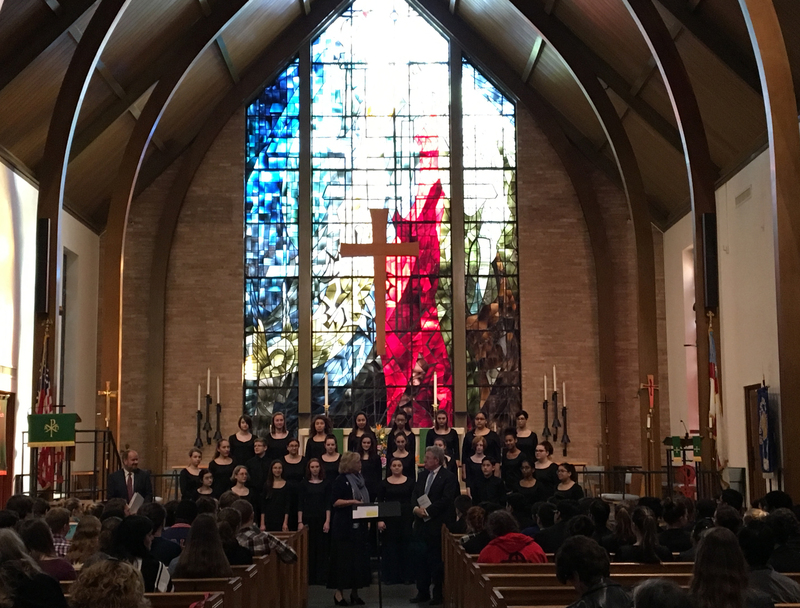 They were followed by the Madison High School Choir, and then the Trinity University Chorale. Each choir sounded magnificent and went from great to greater! The inspiration of being in one of the most visually and sonically superior churches in San Antonio, St. Luke’s Episcopal Church, was a bonus. The love of making music could be seen on the face of every chorister. And then when Fred began to coach each group they showed the eager and joyful expressions of learning and improving. Fred talked about hard and soft vowels and consonants, head-bobbing, French and Italian pronunciation, and more. He also instructed the choir members to look at the audience and not always be glued to the conductor. This masterclass was a unique experience among our many outreach events. We are most grateful to the amazing musicians of Chanticleer and their equally amazing Music Director, Fred Scott for an extraordinary weekend. Our kids are already getting warmed up and they sound glorious 😊 we hope you are on your way to hear it in person!